Cannon County sophomore Abby Jakes, 3, goes up over a Bledsoe County defender for a driving layup in the Lionettes’ 72-29 win. Jakes scored eight in the victory. No. 3-ranked Cannon County took out its frustration from a disappointing loss against Upperman a night earlier with a resounding 72-29 win against Bledsoe County Tuesday. The Lionettes (18-3) started slow and led 14-10 after the first quarter before breaking the game open on the way to a 35-17 halftime lead. 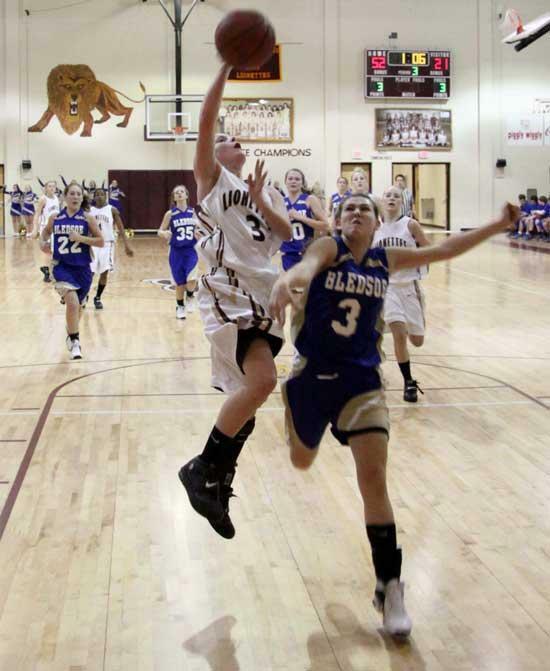 Emily Sissom led Cannon County with 17 in three quarters of action, including three 3-pointers. Chelsey Payne and Lauren Ruehlen each scored 11. Ruehlen has increased her scoring total in each of the three games played since her return. Abby Jakes continued to be a strong contributor off the Lionettes' bench with eight points and super sub Joanna Young sparked the second quarter run with tenacious defense. Cannon County faces a pivotal league encounter at No. 8-ranked Upperman Friday at 6 p.m.
A complete recap of the Lionettes' win against Bledsoe County will be in next week's Cannon Courier.